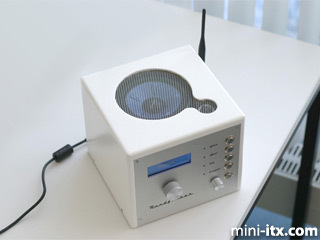 mini-itx.com - news - The "Rundfunker"
The Rundfunker may look like a classic radio, but is actually a custom built Linux powered MP3 player that plays files shared over a wireless LAN. The project was created by a 5-strong team at the FH Augsburg, University of Applied Sciences. The case is constructed from painstakingly varnished MDF and a one-off Aluminium front panel. The team designed an interface module for the rotary dial and buttons - with a microcontroller to squirt information through a serial port header on the motherboard. They created an open source Knoppix based Linux derivative, called it Troubadix and booted it from the Compact Flash slot of the EPIA MS 10000 Mini-ITX motherboard inside. There's a 20x4 LCD display in the front. A custom java applet mimics the front panel and can be accessed by a web interface. An integrated amplifier drives the 2 way speaker system. 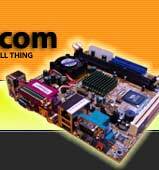 One day all Mini-ITX projects will be like this.